Goodwood. It's still a name that means something to the British racing public, even though it's 27 years since a pukka race meeting was held at the West Sussex airfield circuit. Indeed, much of the circuit's infrastructure remains. It is still used for the occasional sprint event, and barely a day of the week goes by when it is not pressed into service for private testing or corporate functions. Goodwood was founded in 1948 by The 9th Duke of Richmond & Gordon, better known to racing folk as Freddie March, under which name he'd won the 1931 Double-Twelve at Brooklands. What is less well remembered is that, 12 years before he opened the racing circuit across the road from Goodwood House, the family estate, he organised a hillclimb, quite literally in his own back garden. Perhaps unsurprisingly, he set FTD. 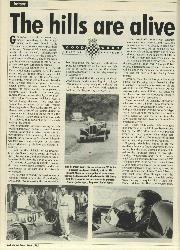 The 1936 Goodwood hillclimb was a one-off, though the roads have since seen competitive activities. Of a sort. 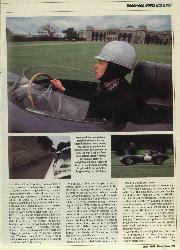 Freddie March's grandson Charles, the present Earl of March, used parts of the course during his teens, amusing himself at the wheel of a 100 national kart. 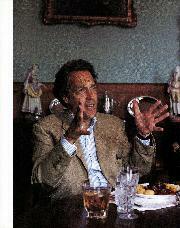 "1 know from a couple of fairly big accidents that parts of it are very challenging," he smiles. His enthusiasm for motor racing is both total and infectious (he has a current Formula Vauxhall Lotus chassis, which he tests for his own amusement at the nearby circuit). At his behest, the second-ever Goodwood hillclimb will take place later this year, on the same course devised by his late grandfather 57 years before. It will be the highlight of Goodwood's Festival of Speed, on June 19/20. 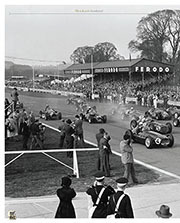 Entry will be strictly by invitation, and only those cars built between 1948-1966 (the period of operation of Goodwood circuit) will be eligible. Thus far, all those invited have accepted, and a full complement of 70 cars and 30 'bikes is anticipated. "We're trying to rekindle the spirit of motor racing as it used to be in the '50s and '60s," says March. "We're making the house available throughout the weekend, with dinner party for competitors on the Saturday night and so on, rather like the one that always used to accompany Easter Monday meetings at Goodwood." Rest assured that the catering at Goodwood House marks something of a culinary leap for modern-day racing folk and, until the Roux brothers get the Oulton Park cafeteria contract, it's likely to stay that way. . . The event will be run with technical assistance from the BARC and HSCC, and several sponsors are already in place. One of these, Brooks, will be holding its midsummer sale on the Saturday, one of many side attractions to the main event (others include a steam fair, numerous static displays and a promised demonstration run by the McLaren F1 road car). Although Robert Brooks is reticent to say too much about what will be under the hammer, he stresses that "The sale will have a British Racing Green theme." Similarly, the entry list has yet to be made official, but it's taking shape. Several 1.5-litre F1 cars are promised, as are a selection of Ford GT40s, Ferrari 250 GTOs, Aston Martin DB4 GT Zagatos and a brace of BRM V16s. Purists will be pleased to note that Goodwood House is not subject to noise restrictions. . . The experienced, and versatile, Tony Dron is scheduled to run a Ferrari 750 Monza on the day, and he was present at the event's launch, acting as chauffeur in Evert Louwman's D-type Jaguar. Also on hand, for general use, were a pair of Jaguar XK I 20s (one in road trim, the other racing) and Nick Mason's Carrera Panamericana C-type. At 1.16 miles (2042 yards), this is the longest hillclimb venue in the UK. 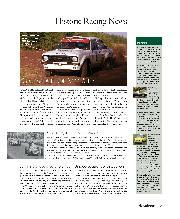 It has been inspected by the RAC MSA, and a competition licence has been granted. Only minor peripheral modifications (the removal of barbed wire fences springs to mind) are required. Originally, March had hoped to site the startline a few yards further away from the first corner, but the MSA deemed it prudent to reduce the approach speed to two righthanders, Waterbeach and The Crossroads, which feels like they have been coated in 20/50 multigrade, even in the dry (Dron, a few inches to your right, grins impishly as he saws feverishly at the unfeasibly large steering wheel, the D-type skipping out of line). There follows a long blast down Park Straight, with the imposing Goodwood House to your left, before heavy braking is required for a tight lefthander, Molecomb. Then the course rises, past The Wall, an imposing tower of flint in which the tone of the stonework is marked by a subtle change as you glide through the mild right-hand flick which greets the arrival of this somewhat fearsome natural obstacle. It looks for all the world as though someone has driven straight into it at some time in the past, necessitating a minor rebuild. March reassures that there is no known instance of anyone having come to grief there, and that a fallen tree or a simple construction failure was the more likely cause. Whatever, it is not a difficult section of the ascent, indeed it's barely a corner, so The Wall's main challenge is purely psychological. Pheasantry Rise continues to Cames Seat, a quick right (where the D-type ran out of fuel). "A shame," shrugs Dron. 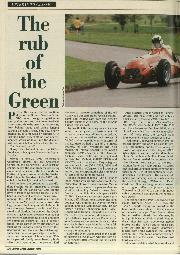 "The last corner (Birdless Grove, a rapid left-hander leading onto the finishing straight) is just fantastic in this thing." We did get a chance to sample the whole course, albeit at a more sedate pace. in the other cars. Although the exact situation of spectator areas has yet to be defined, there is great viewing potential for the public, who will be charged £4 admission on the day (practice will take place on Saturday, though there are no plans for spectator access at the moment). As yet, there is no return road for competitors, so they will ascend in batches of 20. collect at the top and return in convoy to the paddock, situated close to the house, adjacent to the Park Straight. There is scope to create a return loop, however (it is presently littered with debris from various recent storms), and this will be done if, as March hopes, the Goodwood Festival of Speed becomes an annual event. To this end, there are actually other interesting plans afoot, albeit in the longer term. Back to Goodwood Circuit. . .
No one is about to announce its re-opening. There have been countless rumours about that in the past. This time, there have been feasibility studies. The intention is not to rebuild a circuit to Grand Prix standards. There is a more modest, but nonetheless laudable, intention to redevelop it as an occasional venue for historic events, for the same cars that graced it in its original guise. The target would be no more than a handful of meetings per annum, one of them, of course, to take place on Easter Monday. The whole concept has to be evolved in full consultation with environmental groups and local residents, a process which is presently ongoing. As with the forthcoming hillclimb, the idea is to divert the sport away from gestapo-trained officialdom and back towards its garden-party roots.